Eat, drink, have fun and do some good. 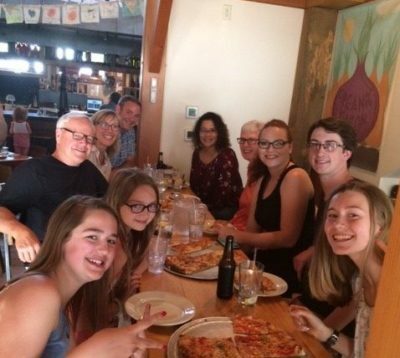 Round up your friends and family for a fun evening to benefit Trekkers adventure-based, youth-mentoring program at Flatbread Pizza, 339 Commercial Street (Route 1) Rockport, on Tuesday, May 22 from 5-9 p.m. Our friends at Flatbread will donate $3.50 for every large pizza purchased, and $1.75 for each small pizza sold, to Trekkers. Reservations are not needed for the event, so you can arrive at any time. The restaurant features scrumptious pizza made from local and organic ingredients in a traditional, wood-fired oven. Call ahead at 706-4146 for take-out. Trekkers is a long-term program that connects young people with caring mentors and leverages out-of-classroom expeditionary learning to help them grow into resilient and responsible adults. In 2017, the Trekkers Training Institute was founded to train other youth development professional throughout the state in the Trekkers model. Trekkers was founded in 1994 as an outdoor-based, youth mentoring organization that now serves 240 seventh through twelfth-grade students from six Midcoast communities and has a state-wide impact through its professional development training arm, the Trekkers Training Institute. For 24 years, Trekkers has been a positive force for raising the aspirations and outcomes of over 700 young people from the RSU 13 district of Cushing, Owls Head, Rockland, South Thomaston, Thomaston plus St. George. Trekkers combines expeditionary learning, community service, and adventure-based education utilizing a long-term mentoring approach to help students build life skills, increase and define their aspirations and pursue post-secondary education. Through grade-specific programs that build on the skills, learning and personal growth gained the previous year, Trekkers incorporates five educational components: adventure-based learning, cultural awareness, community service, environmental stewardship and wilderness exploration. Trekkers seeks to expose students to the diversity of people, cultures, natural resources and opportunities that exist outside the focus of their everyday life and to prepare them for life beyond high school. For more information about Trekkers or the event, contact Paula Coyne at 207-594-5095 or paula@trekkers.org or visit their website, www.trekkers.org.